Say "Hi" to our newest staff member! The Annex is excited to welcome our new Director of Clinical Operations and Services, Erin Wilkins! The Annex is excited to welcome our new Director of Clinical Operations and Services, Erin Wilkins! Erin comes with a wealth of experience and passion for sexual health, and we are thrilled to have her on our team. Here’s a little more about her! I got my start in sexual health during high school through volunteering at the Planned Parenthood in my neighborhood! I’ve always been drawn to sexual health and reproductive justice and have spent most of my career so far in this field. Over the past 15 years, I have lived on both coasts and in the Midwest, and have worked in various roles at community sexual health clinics, abortion clinics, and a FQHC (Federally Qualified Health Center). Independent sexual health clinics are my jam! In addition to having a passion for sexual health and adolescent health, I am also really focused on LGBTQ health and justice, racial justice and healing justice. I hope to bring an intersectional, anti-oppression approach to my work at the Annex and am on a constant journey to learn and grow in this regard. What drew you to the Annex? What DIDN’T draw me to the Annex?! I have worked closely with many Annex staff members over the years and have always respected the clinical services and educational programming that the organization provides. 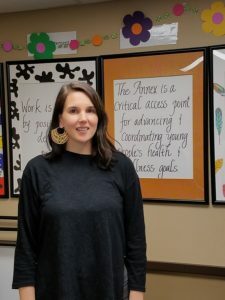 The staff at the Annex are truly experts in sexual health care and education for teens and young adults, and this work is so vital to the overall health and wellbeing of young people in our communities. I also love that the Annex is an independent community clinic and has maintained its unique mission and identity for so many years. I’m excited about so many things here! The Annex has had some really great growth lately and I’m excited to continue that trajectory. I’m excited to learn from the nurses, providers, educators, and administrative staff here. They are really good at what they do and I learn new things here every day. And I’m excited to work on finding new and exciting ways to help make our clinical services even more accessible to the youth who need them most. The sky is the limit for the Annex! I love the Minnesota Lynx, celebrity gossip, and radio rap.